Hey y’all, I hope your summer is heating up and you’re finding some shade during brew days. Quick reminder: We’re holding our monthly meeting at Terry’s house this coming Saturday June 16th. We’ll have all of the typical activities going on, plus a jockey box build session. On the grill we’ll provide bbq chicken but we could use some side dishes. Homemade or store bought, doesn’t matter to us. Bring salad, corn, rice, bread, whatever – Let’s have a cookout. If you’re interested in watching (or if you’re participating in) the jockey box build, arrive at 11am. Noon if you just want to come for the meeting. Looking ahead, we’re confirmed for July 28th at Dean’s for this year’s summer bash. Please help us spread the word to other members. It seems like somebody gets the date too late every year, so talk it up. We are moving into the heavy part of the homebrew competition season, so I hope your beers are ready. There are a number of deadlines to keep track of. First of all, the entry submission window for the National Homebrew Competition is now open. You should have gotten an e-mail from NHC with shipping information to your judging center. Eric Rosen has volunteered to drive down to San Diego, so if that is your entry site, you can drop off entries at the Culver City shop by 2:00 PM Sunday, March 25th. If your site is NOT San Diego, you are responsible for shipping off your entries. Shipped entries must be received by March 30th. Two bottles are needed for the first round. If your beer advances to the finals, you will need three more bottles. Southern California Homebrew Festival update. March is dues month: $36 per individual, $54 for couples. If you haven’t paid yet, please do it at the meeting. Culver City Homebrew Supply offers a discount to Pacific Gravity members, and an additional discount on meeting night? Getting ready for a brew day? Need some equipment? Save a couple of dollars and purchase your supplies and ingredients at Thursday’s meeting. 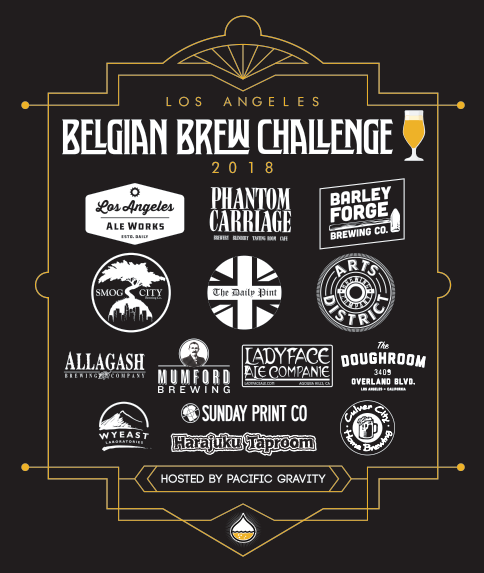 2018 LABBC Registration is LIVE! LA Ale Works, Culver City Homebrew Supply, South Bay Brewing Supply, The Home Wine, Beer and Cheesemaking Shop, and Eagle Rock Homebrew Supply. As always, volunteer judges and stewards are needed. Please indicate if you are interested in and available for either job during registration. Looking forward to an exciting and fun competition, thank you for participating! Reply back with any questions you have, I’ll do my best to get you answers. http://pacificgravity.com/wp-content/uploads/2015/01/pg_logo.png 0 0 Michael Musgrave http://pacificgravity.com/wp-content/uploads/2015/01/pg_logo.png Michael Musgrave2018-02-23 10:43:312018-02-23 10:43:312018 LABBC Registration is LIVE! Homebrew Style of the Month: Browns, Ambers, Reds, and California Common. AND … introducing, in our raffle, a Junior Beer Judge Testing Kit! We will have some interesting commercial examples of our style of the month. Please bring some home-brew to share, too. March is dues month: $36 per individual, $54 for couples. Feel free to pay your fees early at the February meeting. Did you know that Culver City Homebrew Supply offers an additional discount on meeting night? Getting ready for a brew day? Need some equipment? Save a couple of dollars and purchase your supplies and ingredients at Thursday’s meeting.